We survived! Our second National Stationery Show in New York City concluded on Wednesday. I am consistently amazed how we are able to transform a sparse 8’x10’ space with a concrete floor and black curtains at the behemoth Javits Center into our cheery, orange exhibit space. Booth: Our booth was constructed with pvc pipes, spray painted silver to give a metal, industrial feel. Small aluminum lights hooked onto the pipes & illuminated the booth. The rugs were graphic orange & white polka dots. Orange draping is now our signature color and everyone identifies us with the “orange booth.” All of our letterpressed cards were strung from wire and hung with little metal clips, all brightly showcased. Business: We received many reorders from our existing clients, all of whom were very excited to visit with us and see our new card designs. It was a reality check for me. I work as a graphic designer and design all of my projects for clients, but the cards are designed by me and for me. It’s my chance to “play.” I am realizing my cards fit a very small niche. Stores that carry my designs cater to “bookish” customers who appreciate great typography and design. My cards are not generic, nor are they a fit for the average stationery store around the country. I did learn that my cards sell very well in the stores that carry them! Positive: Overall, the show was a fun experience. Breakdowns on my behalf were few. Kosher hot dogs were actually a tasty lunch for three days! We found most of the other exhibitors gracious. Coming to NYC to exhibit is a big endeavor and everyone has a great story to share. I love learning about everyone’s products, processes and what inspires them.There were some beautifully designed booths and creative new products, but I have to admit the International Furniture Fair, one level below, provided the true eye candy. The colors, shapes and textures of the furniture, lamps and fabrics truly inspired me. Negative: Standing on my feet for eight hours is grueling and I attempted Day 1 in heels. Not advised. Saw some Big Egos peddling mediocre letterpress.­ I also think the NSS should do a better job vetting the attendees who walk the aisles. They should admit more people who want to do serious business and less folk who want “free stuff” and steal items while an exhibitors back is turned. And booth breakdown is at noon on the last day of the show. Not 11:50 am. Unbelievable. Inspiration: We are looking forward to filling our all orders. Plates are being made for new cards and I already have some new designs in mind. Thank you, New York City, for the experience + inspiration. With the 2013 Stationery Show ready to begin in five days, I have officially shipped my last box of cards, catalogs and calendars. As much as I plan, it always feels like a marathon the last few weeks and days leading up to our departure to NYC. My to-do list was never-ending in April and early May. Design booth banner: done. Design card catalog: done. Design NSS mailers: done. On Friday night I was still designing cards — ideas were baking, and I wasn’t going to be happy until they were created, printed, paired with a bright envelope and sleeved. As stressful as this show can be, I also find it creatively inspiring. Some of my best work is done on deadline, and I am always amazed at how much creative I do produce when I am super-busy! We invite buyers and retailers to booth 1966 to check out all of our fun cards. It’s going to be a great show! Our Cards Take The Cake! We’ve been busy— lots of designing, planning and creating for next month! 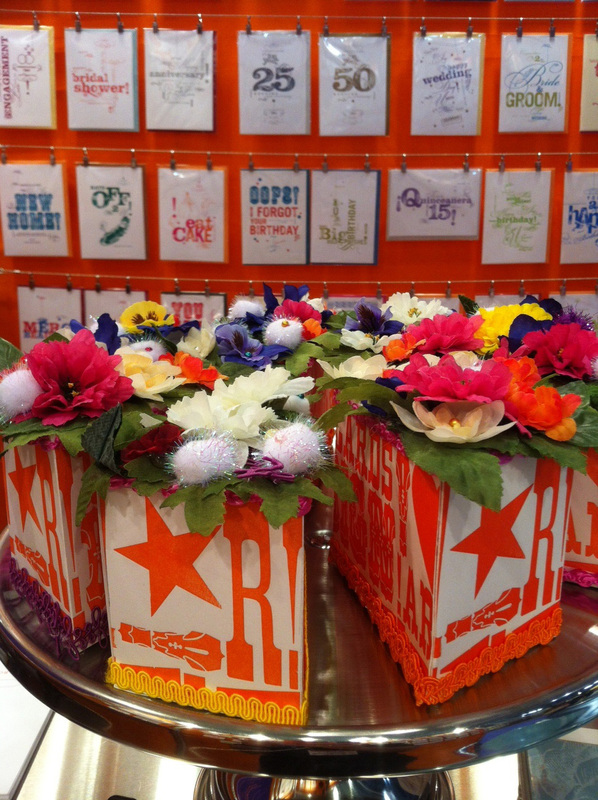 RR Design Shop is excited to be returning to NYC for the National Stationery Show, May 19-22, 2013 at the Javits Center. 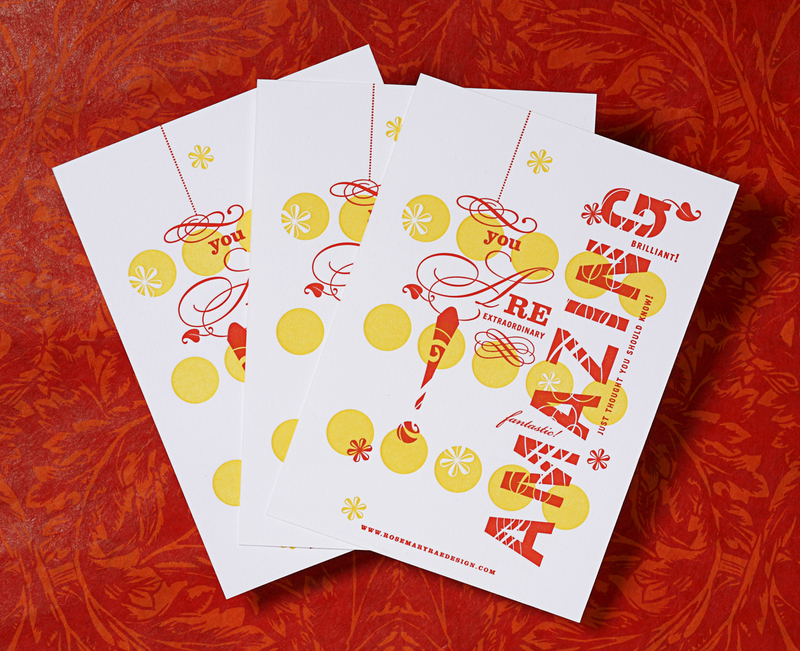 Our beautiful, two color letterpressed promo cards will be arriving in paper stores’ mailboxes next week. We invite everyone to visit us at Booth #1966. Our catalog of cards has expanded to 72 bright + typographically-inspired designs, letterpressed on Cranes Lettra with vibrantly colored inks. Place an order at the show and you’ll receive a little handcrafted treat created just for you! We look forward to seeing you. 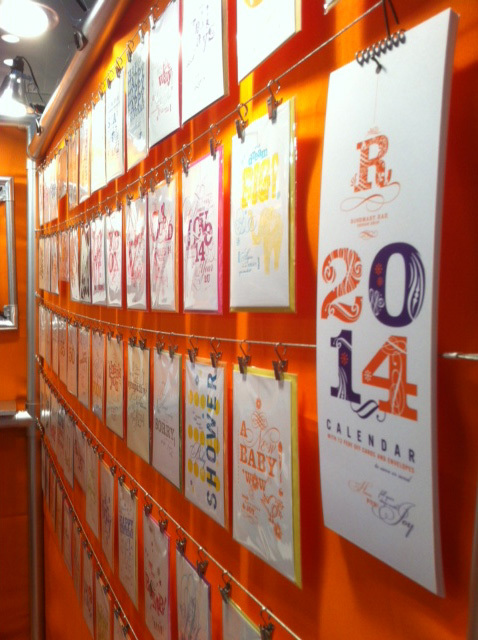 It’s been over three weeks since Rosemary Rae Design Shop’s National Stationery Show adventure. New York City, as always, was bursting with creative energy and we survived our two set up days (not without some small hiccups) and the show itself, which lasted four days. Walking around the Javits Center, we got lost in the sea of paper-madness. It was reassuring, at least for me, that type and paper joy is thriving! Immersing myself in this project was a full-time commitment of my talent and time, in the months leading up to May. Completing a card line was a dream! As a full-time graphic designer with other design obligations and looming deadlines, my project always became a secondary priority. Recently I read this great quote by Ray Bradbury: “You’ve got to jump off cliffs all the time and build your wings on the way down.” It perfectly expressed my feelings about this endeavor. Attending this show motivated me to accomplish the design and presentation of 40+ greeting cards, gather feedback, and return to San Diego with a lot of creative momentum. Booth 1866 was cleverly constructed (pvc pipe painted silver with rows of taught wire to pin my cards) and we received many compliments on its simplicity and cheeriness. My cards definitely popped off the bright orange backdrop, their many colors reminding me of swirl candy! It was also an invigorating color for overwhelmed NSS buyers with fatigue! (A big thank you to Conrad Firestein, my handsome mate and partner through all of this. He was an amazing source of support, ideas and humor! I could not have done this show without him. xxoo!) Orders were written and lots of interest was generated for my unique designs. Now I am in the midst of filling orders, developing new card designs, and completing the design of my website! And if you are reading this, watch for your happy fourth of July card! collage of our booth and signage for the national stationery show held in may 2012 in new york city. With less than 50 days to go, I am making progress on the designs of my cards for the New York Stationery Show. Inspiration hits at the oddest hours, and it seems 3:00 am is when my brain is most active, pumping out ideas for yet more letter pressed cards. My booth design is in process — metal pipes, wire and clamps are the integral pieces; a huge 10′ x 8′ “tinker toy” as my boyfriend has referred to it. Today, looking at NY Magazine’s Design issue online, I found a gray rug with fun letters scattered across it; perfect. Now I have to figure out the logistics of picking it up in Soho and getting it to the show. On Friday, I will be creating the exterior cover of my show catalog with various size letters — a random assortment of metal and wood type. I still have to design my business cards and get the final files to my web programmer so that my card site can be built. I am surprised, though, that I am not overwhelmed by all of these tasks — it seems I have been able to navigate my priorities, week by week, and even with the month of May waving at me on the horizon, I feel confident all will be completed and look great. stationery show prep has begun! The National Stationery Show is in May (Booth #1866) and while that seems like a few long months away, time is advancing quickly. I have a tremendous amount of creative to accomplish between now and then! 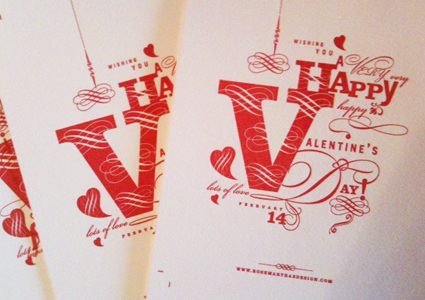 New cards are being dreamed up every day— my Valentine’s were just letterpressed in fireball red ink yesterday, and we will be busy pressing more! In addition to cards, I also want to design two calendars and small unique packages that house groupings of cards, which many friends and fans have requested. It’s exciting! I do enjoy the challenge and know my cards are beautifully different from most that are currently for sale in the retail universe. High-end boutiques and small shoppes are my target, where the hand crafted art of letterpress is truly appreciated by owner and customer alike. My new website is in production — a simple, friendly online shop where retailers and individuals can purchase cards and fun little promos. Production of my booth begins soon as well — I have my color palette and an industrial feel seems to be what is evolving! Bursts of hot pink, yellow and orange will be sprinked throughout, but, of course, the main focus will be the product. In the coming weeks I will be posting photos of more cards as they are designed and letterpressed.